600mm x 450mm Pedestrians Left Sign. Class I reflective zintec plate riveted into an angle-iron..
600mm x 450mm Pedestrians Right Sign. 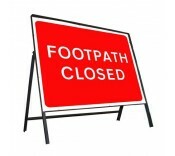 Class I reflective zintec plate riveted into an angle-iro..
600mm x 450mm Footpath Closed Sign. Class I reflective zintec plate riveted into an angle-iron ..